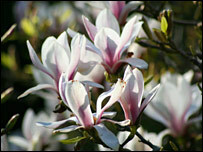 The UK Met Office has released figures showing that this month is likely to be the warmest April since records began. The data has been compiled from observations that go into the Central England Temperature record, which covers a triangular area stretching from the west of London across to Bristol and south of Lancashire. This series, which dates back to 1659, is the world's longest running temperature series. The current spell of warm weather, set to continue across the weekend, has prompted the Department for Environment, Food and Rural Affairs (Defra) to issue its first "summer smog" warning for 2007. It forecasts moderate ground-level ozone levels from Saturday across south-east England and the Midlands. On Sunday, high ozone levels are likely to extend to the rest of England and Wales, officials warn. They have urged people that are sensitive to ozone to take precautions, such as avoiding exercising outdoors in the afternoon. Ecologists say the unseasonable weather could leave wildlife vulnerable if the dry spell continues into the summer. Tim Sparks, from the Centre for Ecology and Hydrology, said the below-average rainfall in some areas was causing concern among scientists. "It has not been the month of showers," he told BBC News. "If it is this dry in April, it does not bode well for the summer. "Shallow root species will be especially vulnerable if we do have a dry summer." Dr Sparks was one of the lead authors of a Europe-wide study, published last August, which provided "conclusive proof" that the seasons were changing. 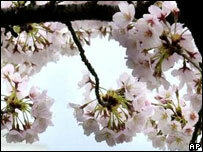 The researchers found that spring was beginning on average six to eight days earlier than it was 30 years ago. He said that the latest figures from the Met Office came as no real surprise, and were consistent with climate models that projected a rise in temperatures. "Certainly, this year is going to see a very early spring; there is no doubt about that. We have seen lots of things leafing or flowering a lot earlier that we would expect to see them appear. "This spring has demonstrated that different species change at different rates to temperature," he added. The Earth has been through all of this before, lets just adapt and enjoy the warmer weather! "The most obvious sign of this at the moment is that oak trees have come out into leaf very well, but many ash trees are still quite bare. This could present problems for local food chains, he observed. "You may have a situation where an insect relies on a particular plant, and birds or other animals rely on that insect further up the food chain. "If there is a breakdown in the synchrony between them then it could be disastrous," Dr Sparks warned. "We may have a butterfly species, for example, whose caterpillars feed on only a very narrow range of plants. "They must maintain synchrony with those plants; if they don't then that species will suffer badly."